White Street was opened in 1806 and soon was lined with comfortable middle-class brick houses. The relentless northward expansion of the city brought commerce to the neighborhood by the 1850's. By the outbreak of Civil War more and more homes were being replaced by factories and warehouses. The White Street block between Church Street and Broadway sat within the developing dry goods district in 1865. That year an impressive marble-faced loft building was completed on three lots at Nos. 46 through 50, built by dry goods merchants Abraham and Samuel Wood. In fact, there were two buildings--No. 46 and No. 48-50-- which pretended to be one. While at least one architectural historian gives credit to the striking Second Empire and Renaissance Revival blend to John Kellum & Son, there is no definitive proof of that. The architect is almost universally listed as "undetermined." Whoever was responsible, he did a masterful job. A cast iron storefront supported four floors or white marble. The united facade included square-headed windows and rounded corners separated by engaged columns--a general design which would be imitated in cast iron by scores of Tribeca buildings to come. Two balustraded stone balconies clung to the third floor. But the architect reserved the most eye-catching elements for the cornice. A dainty corbel table ran below the modillioned cornice. 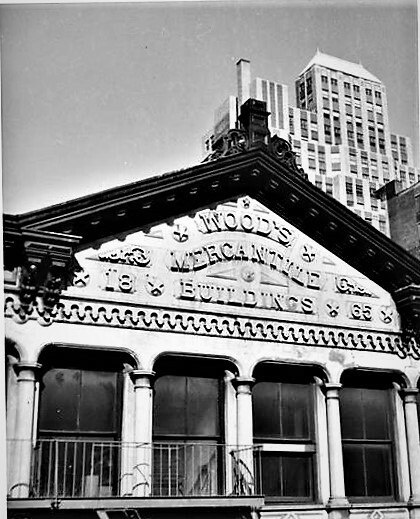 Within the centered, triangular marble pediment were carved "Woods Mercantile Buildings" and "1865." From the beginning it appears that the two buildings were joined internally, at least at some floors. Among the earliest tenants was the newly-formed Wm. I. Peake & Co., importers and jobbers of textiles and cloth finished goods--like blankets, tablecloths, shawls and kid gloves. The firm advertised its address in 1868 as "Nos. 46, 48 and 50 White Street." 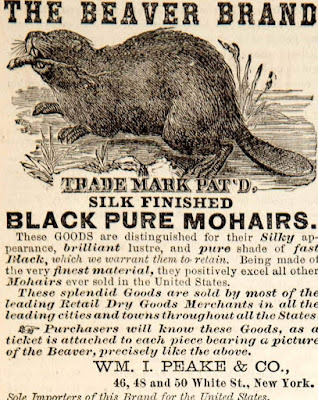 Beaver Brand Mohair--This article our women folk pronounced the most useful and beautiful material for ladies' dresses to be found in the country, and we have great confidence in their judgment...The "Buffalo Brand" Alpaca is another article which we can also strongly recommend. David A. Lindsay, as well, started his business in 1865. While he leased more than one floor, unlike Peake his were solely in No. 48-50. Directories described his business as "manufacturers' agent, commissioner merchant and importer of dry goods, linens and white goods." Another initial tenant was L. B. and S. H. Warner. The brothers seem to have focused their advertising on personal transactions than business. On July 9, 1868 an ad appeared in The New York Herald that read "A gentleman having lost one of a very fine pair of horses, wishes to exchange the other and a good family carriage for a matched team, black or bay, good size, sound and kind, not more than 8 years old. Address or call upon L. B. Warner." The following year on August 24, 1870 he placed another ad: "A superior pair of family carriage horses for sale--Black; 15-3/4 hands; eight years old; sound, kind and true; sold only for want of use. Inquire of L. B. Warner, 46, 48 and 50 White street." His brother was not immune. A week earlier he had advertised "A complete family establishment for sale--Pair black Carriage Horses, 15-1/8 hands, sound and kind; large six seat Carriage, in first class order, also good silverplated Harness; price $1,600. For particulars inquire of S. H. Warner, 46, 48 and 50 White street." In 1871 William Peake reorganized his company as Peake, Opdyke & Co. and moved to Broadway and Howard Street. Other dry goods and apparel firms soon took space in the White Street building. The design--which potentially enabled the owners to expand the building seamlessly later--would inspire similar cast iron buildings throughout the district..
Cahm, Salmon & Fribourg, shirt manufacturers moved into No. 46; and the Manhattan Cloak & Suit Co. leased space in No. 48-50. David A. Lindsay was still operating from the building. In 1886 The Great Metropolis of the United States "The business occupies the lofts of a large and commodious structure, and the spacious and well-ordered salesrooms contain one of the largest and most complete stock of goods incident to the line to be found in the city." The same year The New York Times profiled another highly-visible tenant, Barbour Brothers Company. The linen firm was run by Robert Barbour and his nephew, William, and traced its roots to Lisburn, Ireland where John Barbour first established his flax mills in 1784. In addition to its operation in Ireland, the it had mills in Paterson, New Jersey. The business headquarters were in the Woods Mercantile Building and branch offices were in Boston, San Francisco, Philadelphia, St. Louis and Chicago. The Times said "they manufacture and sell several times as much as all the other houses of the kind in America combined." 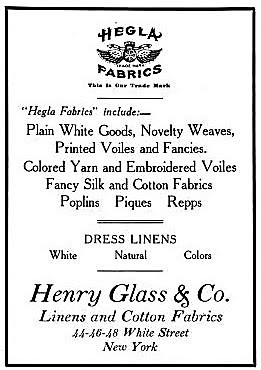 Henry Glass & Co. had been in the building for several years in 1915 when it leased the building next door as well. On December 11 the Dry Goods Economist reported "Henry Glass & Co., importers and converters of linens and white goods, 46-48 White Street, have taken possession of the adjoining stores, at No. 44." The article noted "With the three stores the firm have probably a greater floor area than that of any other concern in the line. Their entire premises have been rearranged and redecorated" Two years later the ground floors were joined internally for firm. The Woods family retained possession of the property for nearly a century, leasing space through the first three quarters of the 20th century to related textile and dry goods concerns, as well as a dry dye manufacturer. In 1978 a conversion to residential use was begun. Completed the following year, it resulted in just four units above the ground floor retail space (the top two floors form a duplex). The building's striking design and architectural importance earned it individual landmark designation in 1979.